If that's not the case, then some concern is warranted. For pitchers, a loss in velocity correlates with less success. Velocity is important. The faster you throw it, the harder it is to make contact. There is a correlation between velocity and strikeouts. So it'd be swell if these starters see an uptick in velocity. And on that front, I bring you some good news. For the top four in the rotation, there was a rather significant leap in velocity during their last time through the rotation. We'll head back to April 22nd in Cincinnati, when things started to turn for the better. According to Brooks Baseball, on that afternoon, the average velocity of Jake Arrieta's sinker was up more than 2 mph from his last time out. All of his other pitches were anywhere from 1.5-2.5 mph up, as well. And, when looking at max velocity, Arrieta threw the fastest pitch of the season for each of the pitches in his repertoire. Arrieta's since made another start in Boston, and all of his pitches were right in line with his velocity from the time before. Jon Lester's four-seam fastball was up nearly a full mile per hour in his last outing, on the 26th. His fastball velocity hadn't been as much of a problem as the others'. Lester's other offerings had been way down, though. For instance, his cutter was down more than 2 mph less than where it was at last year. His cutter is a big weapon for him, and he used it to much success last year. His cutter was worth more than any other cutter in the league last year, according to Fangraphs' pitch values. His cutter has been a below-league average pitch this year. Last time out, Lester's cutter was up 2 mph from the time before, right in line with where it's usually at. His sinker, curve and change were also well up. On the 23rd, John Lackey saw his four-seam fastball velocity shoot up over 2 mph from where it was the last time out. Like Arrieta and Lester, his other offerings were all up about 2 mph, too. And in his next start, in Boston, all of his stuff jumped up around another full mph. Lackey's four-seam fastball averaged 92.33 mph in Boston. For the year, it was at 92.49 mph in 2016. Kyle Hendricks' last outing, on the 25th, may have been the most encouraging, though. For one, those other guys were still getting it up into the 90s, despite the velocity loss. They have some nasty stuff. It can play at 91-92 mph. Hendricks, though, has always had an acute lack of heat. Drop his velocity any lower, and who knows how his stuff will play? And with an added 2.5 mph on his four-seam fastball and his sinker his last time out, he looked more like the pitcher that led the NL in ERA last year. One of the problems for Hendricks had been that there was only about a 6 mph difference between his fastball and changeup in the early going, as I pointed out on twitter. There was a 7 mph difference against the Pirates. He'd probably like to have the difference up around 7.5-8 mph, like last year. But, it was definitely a step in the right direction. So... pretty encouraging news there. Those four all saw big velocity jumps the last time they pitched. Some of them might still be a mile per hour or so lower than usual, but it's not as dire of a situation if they stay at those levels. And maybe they are still in the process of building up, and they'll eventually get all the way back up to normal velocity levels. You'll notice the one pitcher I didn't mention is Brett Anderson. His velocity is also down and has been rather consistent all year. There was no leap for him the last time out. I'm not sure if we should expect one, either. The other four are coming off of a long season, had been eased into action during the spring, are going to be expected to pitch a lot more innings into the fall again this year, and some are getting up there in years. Those are all reasonable explanations as to why their velocities have been down -- either naturally occurring or through some intervention from Cubs' brass. Anderson's different. He only threw 11.1 innings in the majors last year and was hurt for most of the year. He's been hurt a lot. He might get hurt again. This might just be who he is now. I don't know precisely what to expect from Anderson. As I just mentioned, he's been injured a lot. We'll need to see some more of him before we have any idea of what kind of pitcher he is at this point in his career. I'd like to delve into the idea of Hypothetically Healthy Brett Anderson, though. I think Brett Anderson is the perfect fit for this team. Well, Clayton Kershaw's actually the perfect fit. But, for his role, his cost, and assuming the payroll has some type of restriction, Anderson will suffice. You see, Brett Anderson gets ground balls -- a lot of them. Since entering the league in 2009, Anderson's GB% is the third-highest in the league of 158 pitchers with at least 600 IP. There's a debate that can be -- and has been -- made on whether ground-ball pitchers are better than fly-ball pitchers. Bill James isn't much of a fan of ground-ball pitchers. He may be right. It appears that they do wear out quicker. But, we're not so worried if Brett Anderson wears out. He's a cheap, one-year rental that may already be worn out. (Kyle Hendricks is a different story.) There is research that suggests that ground-ball pitchers do fare better than fly-ball pitchers, though. James believes that most of the great pitchers from any era are fly-ball pitchers. He might be onto something. Then again, Clayton Kershaw is a ground-ball pitcher -- at least the sub-2.00 ERA vintage of the last few years. From the last article I linked, the author, Neil Weinberg, speculates that it "might be harder to be great as a ground ball guy, but I don’t think it’s harder to be good." He also might be onto something. The distinguishing factor can be summed up in one letter: the K. Big strikeout guys tend to be fly-balls pitchers. They tend to throw hard and like to throw high heat by you. Ground-ball pitchers maybe don't have such a powerful fastball and rely on keeping the ball low and throwing pitches that drop, so as to not be squared up. The two are simply different styles that lead to different results. As an aside from the Cubs talk, I'm going to ramble on for a while about the GB/FB/good/great dilemma. Skip ahead a little if you'd rather just read about Brett Anderson. Skip further if that thought also bores you. Fangraphs has batted-ball data going back to 2002. Looking at the best pitchers' years since then, according to WAR, you'll notice a few things. The top 15 or so seasons nearly exclusively feature seasons where a pitcher struck out at least 10 guys per 9 innings. There's also a lot of fly-ball pitchers in there: Verlander, Schilling, Pedro Martinez, Randy Johnson, and so on. These guys had long, prosperous careers, striking out the world for decades on end. Fangraphs' version of WAR is based off of peripherals (FIP) and not how many runs were actually given up. So if we want to see which were the best seasons, based on actual runs allowed, let's search the top seasons based on RA9-WAR since 2002. Here you see fewer double-digit K/9 seasons and more ground-ball pitchers. Of the top 30 seasons according to WAR, 8 pitchers had a GB% over 48.0%. Of the top 30 seasons according to RA9-WAR, 13 pitchers had a GB% over 48.0%. There are a couple things I think we might be able to glean from this. For one, the top WAR seasons were actually better seasons than the top RA9-WAR seasons. That's to be expected. ERA is not a great stat. There's a lot of luck and randomness that can affect how many runs you give up. FIP is a better stat. If we look at the top 30 WAR seasons, 28 of those pitchers were also worth at least 7 wins, according to RA9-WAR. Of the top 30 RA9-WAR seasons, 7 pitchers weren't even worth 6 wins, according to WAR. All of the seasons, on each list, were very good seasons. But the truly elite seasons -- ones that were elite according to any metric -- are found on the WAR list. And that list has more fly-ball pitchers on it. A lot of guys on the RA9-WAR list lucked into elite seasons that probably should have been more good than great. The peripheral-based measurement likes strikeouts, and it proves out. Strikeouts are great. At the same time, those fly-ball pitchers, while striking out more guys, are also going to give up more home runs than ground-ball pitchers. The more balls hit in the air, the more that are going to fly out of the stadium. So there is a certain baseline for these fly-ball pitchers. They are going to give up a certain amount of runs, just based off of how many home runs they give up. It's going to be more difficult for them to go really low with their ERA. So maybe the best way to have a truly majestic season is to keep the ball on the ground, keep it in the park, and also post really good strikeout- and walk-rates -- think Arrieta and Greinke in 2015 and Kershaw, well, every season. Then, there's Pedro Martinez, who was a fly-ball pitcher that somehow was near impossible to take deep, even during the steroid years. We only have two of his prime seasons on these lists. But, Pedro breaks the mold for fly-ball pitchers just as Kershaw does for ground-ball pitchers. Whatever is the optimal pitching prototype, it's probably one of those two, for the pitchers that we have batted-ball data on. I do agree that it is easier to be great when you are a fly-ball pitcher, though. Most of the fly-ball guys on those lists had long, Hall-of-Fame-type careers. Some of the ground-ball pitchers that popped up on the RA9-WAR list -- Derek Lowe, Tim Hudson, Roy Halladay -- saw their reigns of terror end much sooner. I would argue this is mostly because of the strikeouts. If you are Tim Hudson and you are already down at 6 K/9, can you really afford to drop to 5 K/9? Randy Johnson should be able to do alright dropping from 12 K/9 to 11 K/9. But, if you already have that many balls being put in play against you, how many more can you afford? Ground balls are great, but if you have trouble putting batters away, that might catch up to you sooner as you age. Maybe guys like Jake Arrieta and Kyle Hendricks will age better than other ground-ball pitchers, since they are striking out 8 or 9 guys per 9 innings. Perhaps that's wishful thinking, but it will allow me to segue back to the 2017 Cubs. I surmise that it is probably easier for ground-ball pitchers to be good, even if it is tougher for them to be great. We don't have to worry about Brett Anderson being great, anyway. He won't be. He might be able to put together a good season, though. And there's not exactly a bunch of 11 K/9 fly-ball pitchers sitting in the bargain bin at the free agent market. Anderson's role was filled last year by a fly-ball pitcher. Jason Hammel's drifted more towards the extremes in that direction as he's gotten older. His FB% was the 18th-highest in the league last year, of qualified starters. There's no real problem with Jason Hammel. He gave the Cubs two-and-a-half solid seasons. He was worth 6 wins for the Cubs in those seasons, while moonlighting for Oakland for a few months, as well. He also helped land Addison Russell, and has a World Series championship ring to show for his time in the Windy City. I don't think he was a great fit, going forward, though. For one, he seemed to regress a bit last year. His K rate dropped while his BB rate shot up some. He got some more ground balls and kept the ball in the park for the most part. But, as I mentioned earlier about fly-ball pitchers having a certain baseline due to the amount of homers they give up, Hammel's baseline isn't that great. His K/9 was over 9 in 2015 and, coming with a 2.11 BB/9, his FIP and ERA both came in around 3.7. That's fine. But add some more balls in play and some more guys on base, and his ERA is at the whimsy of his HR/FB rate. Now, well into his 30s, that's a scary thought. Anderson relies more on getting outs on balls put in play. Hammel relies on striking guys out and hoping home runs don't do too much damage. And the Cubs are excellent at turning balls in play into outs. Opponents' BABIP of .255 against the Cubs last year was, by far, the lowest of any team's in the last ten years. The Cubs' defense saved the third-most runs of any defense of the last ten years, according to UZR. DRS has them saving the second-most. The defense is mostly the same this year, save for inserting Kyle Schwarber into a left field position that was patrolled by a bevy of different players, and swapping Dexter Fowler for Albert Almora. Almora should make the defense a little stronger and Schwarber will take back some of that value. Ben Zobrist is getting older and might take a step back defensively. But the rest of the defense is made up mostly of very young and very good defenders. A ball flying out of the park for a home run is the worst outcome for any defense. But, it hurts more when you have an elite defense, such as the Cubs'. (More on that later.) Keep the ball in the park and let one of those elite defenders track it down and turn it into an out. Better yet, keep the ball on the ground, hit at the elite defender at shortstop, the really good defender at third, the Platinum Glove winner at first, or (when he's in the lineup) the elite defender at second. Since the start of the 2016 season, the Cubs' BABIP on ground balls is .280. The next-lowest BABIP is .302. The Cubs are excellent at turning ground balls into outs. They were better than everyone at it last year, and they're better than everyone at it this year. In fact, they're not just better than everyone at it; they are in their own realm. No other team comes close. Of all the things the Cubs are good at, turning ground balls into outs is what they are best at. It's not the most important thing they do. But it's what they do best. According to Statcast data, based on launch angles and exit velocities, the Cubs' BA on ground balls is .052 lower than their xBA (expected batting average), since the start of the 2016 season. The Giants come in second with a .021 difference, with the Indians third at .016. Those are a couple of very good infields, led by a couple of Gold Glove-winning shortstops. And the Cubs would have to squint to see them in the rearview mirror. It's remarkable how large this gap is. The Cubs turned ground balls into outs better than anyone last year, and they're doing the same again this year. This is a luxury that Cubs’ pitchers can enjoy that no other pitching staff is privy to. We'd be well-served to exploit this advantage, if at all possible. Last year, the Cubs reaped the rewards of this asset by employing a starting rotation with the 7th-highest GB%, at 46.7%. Take out the one extreme fly-ball pitcher and replace him with an extreme ground-ball pitcher, and, wouldn't you know it, the rotation's GB% is up to 49.5%. While things haven't gone to plan with the rotation so far, they have a lot of convenience at their avail, if they can figure some other things out first. The idea of tailoring your roster to fit your resources isn't new. Over the last ten years, Rockies' pitchers have posted the 2nd-highest GB% of any teams'. That didn't happen by accident. Fly-ball pitchers are hurt more by pitching in HR-friendly parks, while ground-ball pitchers aren't hurt as much. The Royals used both their roster set-up and their home environment to identify Chris Young as a good fit. Extreme fly-ball pitcher in a big park, with an amazing outfield defense backing him up... seems like a good fit. And it was in 2015, when the Royals won the World Series. Young posted an ERA of 3.06, which was a run-and-a-half better than his FIP, which, in turn, was nearly a run better than his xFIP. It hasn't worked out so well for Young since then, but he's also, well, bad now. If Brett Anderson is bad, then it doesn't matter too much who is playing in the infield behind him, because he's still going to be bad. It would help if he stopped walking as many batters. But, as of now, he's got a lower ERA than any of his rotation mates, and his FIP is 2nd-lowest. It hasn't been pretty. And he's had to wriggle out of some messes. But that's kinda the point with him. He doesn't have to be pretty, when he has that infield behind him. He can get out of jams, because he's likely to keep the ball in the park. And if he's not up to the task, then there's a certain World Series-clinching pitcher with the 4th-highest GB% of 154 pitchers that have thrown at least 100 innings since the start of last year in the bullpen waiting for his turn. Things aren't going very well on that front with some other guys. Of 106 qualified pitchers, John Lackey has the 9th-highest HR/9 at 2.10. Jake Arrieta comes in 18th at 1.86. Kyle Hendricks' 1.64 would rank 25th, if he had pitched enough innings to qualify. Lackey also has the 8th-highest HR/FB at 23.3%. Arrieta is 13th at 21.4%. And Hendricks' 17.4% would rank 29th. Not good. Can this opposition home run barrage continue, though? Eh, not so much. At least it won't be quite this bad, I'm sure. As I said earlier, Fangraphs has batted-ball data going back to 2002. Since 2002, there have been 1,281 pitcher seasons for qualified starters. Out of those 1,281 seasons, the only one with a HR/FB over 20.0% is Jaime Garcia at 20.2% last year. Jake Arrieta is not going to have a 21.4% HR/FB rate this year. What's going on right now is that these three are carrying fluky high HR/FB rates. It's not necessarily that the home runs they've given up are fluky. It's just fluky that they've given up so many in such a short time. In a small sample like this, a couple of mistakes can throw things all out of whack. Hendricks and Lackey have career HR/FB rates of 10.0%. Arrieta's is 10.6%. They simply aren't going to all shatter the record for highest HR/FB or anything like that. That's not to say that their rates won't go up from where they've been in the past. That very well could happen. HR/FB rates have skyrocketed league-wide the last few years. It's possible these guys will be swept up by the home run bonanza. But not quite like this. This is due to variance and small sample sizes -- at least partially. They're not the only ones dealing with this. Nathan Karns isn't going to have a 30.0% HR/FB rate all year. And Mike Leake, he of the career 13.4% HR/FB, isn't going to stay at 0.0% all year. It's early. And HR/FB rates are crazy unstable this early. It takes some 400 fly balls for a pitcher's HR/FB rate to stabilize. Jake Arrieta's had 28 fly balls hit off of him so far. Give it time. The home run rates will drop -- how much, I'm not sure. So what can we expect if the HR/FB rates even out for these guys? Well, we've got a good stat for that. ERA obviously gives us a pitcher's earned run average. FIP is an estimate of what a pitcher's ERA would be if we stripped away luck, defense, and the sequencing of events. FIP shows us what a pitcher's ERA should look like, assuming average results on balls in play. xFIP is the same as FIP, except instead of using home runs, it assumes the pitcher has a league-average HR/FB. xFIP, therefore, gives us an idea of what kind of seasons these guys would be having if not for all the homers. Assuming a league-average HR/FB, Arrieta's xFIP is 3.19. That's more like it. That gives us a good idea of how much these home runs have hurt him. His BABIP is also rather high at .324. I think we can probably expect his BABIP to drop, especially with that BABIP-suppressing cartel playing defense behind him. But, even if not, his BABIP hasn't been that much of a problem. It's the homers that have done him in. (His GB% is also down quite a bit, for what it's worth. But that is already factored into his xFIP.) The other stuff looks good, though. His K% is at 27.6%. It was 27.1% in 2015. His BB% is at 6.5%. It was 5.5% in 2015. That is encouraging. Lackey's xFIP is 3.56. His K% is down from 24.1% to 23.1%. His BB% is down from 7.1% to 6.9%. Right on track. And his GB% is up a fair amount from last year. His BABIP is at .286; ZiPS predicts a .288 BABIP for him going forward. His ball-in-play results have been normal. And his K rate and his BB rate are normal. His only real problem is that HR rate. Hendricks' xFIP is 4.51. His ERA is 4.50. His FIP is at 5.13. The damage from his HRs haven't been as noticeable, because he's got a .238 BABIP. With league-average results on balls in play, he'd probably be doing a little worse. Hendricks' problems go beyond the home runs he's given up. He's not striking out as many guys and he's given away a lot more free passes. He's had trouble with both his control and his command. It's not all bleak, though, as he looked a lot better in his last outing, after the velocity spike. We can only hope that he fixes whatever issues are ailing him. Another start like his last one, and I'd feel a lot better. So Hendricks has some work to do. But maybe Arrieta and Lackey will be fine if only they'd see their HR/FB rates drop. How fluky have those rates been, anyway? How far should we expect these HR rates to drop? Arrieta and Hendricks, when at their best, get a lot of weak contact. They've been able to post HR/FB rates well below league-average. They've been able to maintain FIPs and ERAs below their xFIPs. Lackey's typically had a league average HR/FB rate. He's a guy with a FIP, an xFIP, and an ERA that all look similar, when things are going normal. Let's poke around at some Statcast data and see if we can figure out what exactly is going on with them. There are a few things that can help us out. Obviously, a sure-fire way to give up a lot of home runs is to serve up a lot of pitches that are hit hard and far. 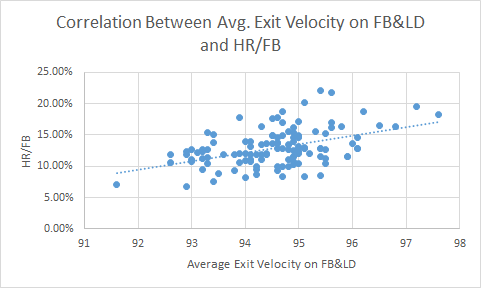 There is a moderate correlation between the average exit velocity on fly balls and line drives and HR/FB. I took the data on all 118 pitchers that pitched at least 120 innings last year. The correlation between EV on FB&LD and HR/FB was .4613. 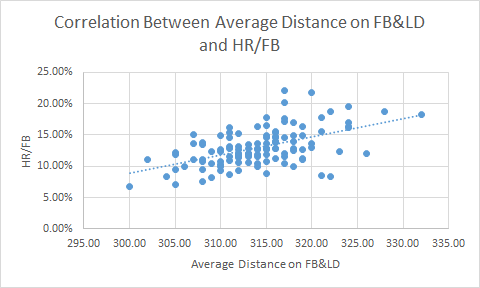 The correlation between average batted ball distance on FB&LD and HR/FB for those same pitchers was .5298. Earlier, I briefly mentioned a new stat that is being kept with Statcast data, called "barrels." The parameters change based on a ball's exit velocity and launch angle. But these are balls that are hit very hard and at launch angles that are conducive to power. Not all barreled balls will be home runs, and not all home runs are barreled. But barreled balls are dangerous. The league average slugging% on barreled balls this year is 2.664. You don't want a guy to barrel one of your pitches. 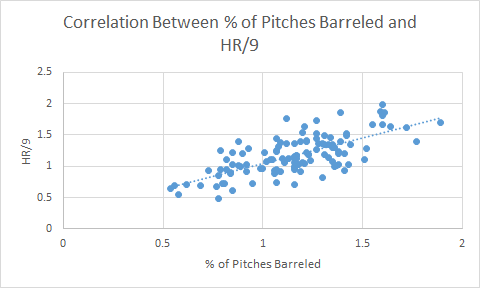 I took the data on those same 118 pitchers from last year that pitched at least 120 innings, and found a pretty strong correlation between the % of pitches that were barreled and HR/9 -- .6976. That gives us three things we can look at to see how fluky these HR rates are. These might help foretell if these rates will drop and give us an idea how far. Since these things correlate with HR/FB and HR/9, if a guy were not getting hit hard, not getting the ball hit far against him, and not getting barreled, perhaps he'd just been incredibly unlucky with his HR/FB rate over 20%. Before we get to what I know everyone wants to see, I'd like to mention how good these starters were last year with this stuff. It was very challenging to make hard contact against them. There were 119 pitchers that threw at least 2,000 pitches in 2016. Of those 119 pitchers, in terms of average exit velocity on fly balls and line drives, Lester ranked 9th-lowest, Hendricks was 24th, Arrieta was 33rd, and Lackey was 87th. In terms of average batted ball distance on fly balls and line drives, Arrieta was 2nd-lowest, Lester was 5th, Hendricks was 23rd, and Lackey was 54th. In terms of % of pitches that were barreled, Hendricks was 4th-lowest, Lester was 6th, Arrieta was 12th, and Lackey was 36th. Lester, Arrieta, and Hendricks were among the elite at limiting hard contact. There's a reason why they were able to suppress BABIP and home run rates, beyond having an amazing defense behind them. They are just tough to hit when they are on top of their games. Lackey was more in the middle of the pack, and the results reflected that. His HR/FB rate was nearly identical to the league-average. His BABIP was higher than the other guys, too. His ERA was lower than his FIP, thanks to the sterling defense. But, everything else about him was perfectly average. Yeah, 2016 was a lot of fun for us Cubs' fans. Now onto what might be slightly more unpleasant. We're going to look at the same stuff, while filtering to include the 118 pitchers who have thrown at least 300 pitches this year. Of those 118 pitchers, in terms of average exit velocity on fly balls and line drives, Arrieta ranks 14th, Lester is 25th, Hendricks is 51st, and Lackey is 92nd. In terms of average batted ball distance on fly balls and line drives, Hendricks is 37th, Lester is 67th, Arrieta is 76th, and Lackey is 80th. In terms of % of pitches that have been barreled, Lester is 11th, Hendricks is 30th, Arrieta is 47th, and Lackey is 100th. That's... not so bad. John Lackey's been hit hard. He's getting barreled up quite a bit. And he ranks poorly under all of these metrics. He's maybe not as bad as his rankings on the HR/FB and HR/9 lists would indicate (nearly the worst in the league). But, he's close. There's no mirage there. Still, a 23.3% HR/FB rate is nearly certainly unsustainable. It will get better. How much better depends on how often he continues to get barreled up. I would be remiss if I didn't mention one of the reasons that no qualified pitcher has posted a HR/FB above 20.2% in the 15 years for which we have data. It's not that it's an impossible feat to go higher, but it's near impossible to go higher and stay in a rotation long enough to qualify for the ERA title. Let's go through those 15 years again and drop the threshold to 80 IP. There are some more guys that are over 20%. The only one above 22.1% is Mark Mulder in 2006. So, even still, Lackey's 23.3% seems exceedingly unlikely. You'll notice a few familiar names on there in Mulder, Freddy Garcia (2013), and Jason Marquis (2012). These guys were on their last breaths as major league pitchers. Mulder only pitched 12 more innings after 2006. I suppose it's possible that Lackey's cooked, and that he keeps giving up homers at this pace, before being removed from the rotation at some point. If he's still giving up 2 HR per 9 innings in June, it'd be hard to keep rolling with him. I don't think that will happen, though. And this is just my appraisal, with no basis or rationale: Lackey seems to have a lot left in his tank. Mulder, Garcia, and Marquis were striking out around 5-6 batters per 9 innings during those years. And their fastball velocities were all well short of 90 mph. As I showed earlier, Lackey's velocity has gotten back to normal. He's right where he was at last year. In fact, he was throwing harder in his last start than he was throwing 10 years ago. He's striking out 9 per 9 innings. His walk rate is right where it's always at. His plate discipline numbers are right where they always are. He's throwing the same amount of pitches in the zone. Batters are swinging at and making contact with pitches -- in and out of the zone -- at the same levels he's always been at. His batted-ball data looks normal. His Hard-hit% is up a hair. But nothing's out of whack, except his HR/FB rate. Everything in his profile looks normal, except he's given up a bunch of homers. I'd opine that he's simply made a few more mistake pitches than he usually does. It's early in the season. He wasn't working with his same velocity out of the gate. And he just fed hitters a few more mistake pitches than normal. Those pitches got hammered, drove up his exit velocity and barreled numbers, and left him with an unsightly HR/FB rate and an ugly ERA. As long as he's working with his normal velocity from now on, I think he'll get back on track. It just doesn't make sense to me that a guy who is still avoiding bats like this to also become the easiest guy in the league to barrel up. His stuff looks fine. So how likely are the gopher balls to continue like this? With the Mulder group, those three guys had retirement written all over them. Their HR/FB rates were only part of the story. You could see decline all over the rest of their profiles, as well. The three other returning Cubs' starters -- while not elite at contact management, like they were last year -- haven't been getting hit too hard. They are all well above league average in barrel % and average exit velocity. There is serious dissonance between this data and Arrieta's 21.4% HR/FB, and even with Hendricks' 17.4%, for that matter. Hendricks has some other things to correct, but he made some headway in his last start. I haven't written much about Jon Lester, mainly because I'm not worried about him at all. He's not striking guys out like we've been accustomed to, but he's been one of the most reliable starters in the league for a long time. He's pitched at least 200 innings in 8 of the last 9 years, with his only miss being in 2011, when he "only" pitched 191 innings. During those 9 years, he's been worth nearly 38 wins. He's been a sure bet to be worth somewhere between 3 and 6 wins every year. He's averaged 5 wins per season in his last three years. And he hasn't even been bad, per se. He's just not where he was at last year. Actually, he's probably been even better than his numbers would indicate. Heading back to Baseball Savant, we'll search through the 132 pitchers that have thrown at least 300 pitches. Of these 132 pitchers, Lester ranks 130th in xwOBA-wOBA. His wOBA is .065 higher than Statcast expects it to be, based off of exit velocity and launch angle data. Arrieta ranks 127th. Those two are probably the most perplexing pitchers on the staff right now. For one, they have the best pedigrees on the staff. And they've had a lot of trouble with BABIP and/or HRs, despite all of their other stats being pretty good. And we just saw earlier that they haven't really been giving up much dangerous contact. This screams fluke to me. Statcast thinks Lester's been one of the handful of unluckiest players in the league, and that's while assuming he has an average defense behind him. As we know, that's not the case. If anything, we'd expect Statcast to think he and Arrieta are lucky, like it does with Hendricks and Lackey, who have low BABIPs, as is to be expected with the Cubs' defense. I'm actually very encouraged about the Cubs' rotation. I'll admit it hasn't been pretty. And the drops in velocity were extremely foreboding. But after perusing this data, Jake Arrieta, in particular, comes out looking very well. His peripherals are back to his 2015 Cy Young levels, and he's actually done a good job of limiting dangerous contact, despite the atrocious HR rate. Jon Lester also comes out looking well. He's pitched pretty well as it is, and it seems like he's probably just been getting BABIP'd. I feel better about Hendricks, too. Like Arrieta, he has actually done a good job of limiting dangerous contact, despite his rough start. And he looked a lot better once he bumped his velocity back up a couple of notches. Brett Anderson has admirably filled the role of random ground-ball pitcher feasting off of the Cubs' infield defense. He hasn't been very good, but he doesn't really need to be. John Lackey's problems seem real. He's given up a lot of dangerous contact. But it doesn't seem feasible for this to continue at the rate it has. Hendricks and Lackey still need to fix some issues that are real. And none of the starters look quite the same as they were last year. I'm not sure if we'll get back to the halcyon days of 2016, but I don't think there's complete darkness ahead.